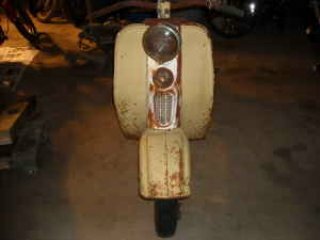 HI FOLKS, ACTUALLY I I FOUND THIS BEHIND A BARN IN UPSTATE NEW YORK AND HAD TO HAUL IT OUT OF THE YEARS OF MATTED HIGH GRASS SURPRISINGLY THIS IS NOT ROTTED THROUGH, ITS BUILT LIKE A 54 CHEVY AND IT WEIGHS A TON, ORIGINALLY BUILT BY MITSUBISHI OF JAPAN FROM WHAT I READ SO FAR, THESE ARE BECOMING THE RAGE IN SCOOTER RESTORATIONS. 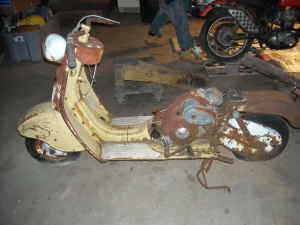 PARTS CAN BE FOUND ON VINTAGE SCOOTER SITES SURPRISINGLY IT’S 80% PERCENT COMPLETE. MISSING REAR DROP PAN AND SEAT, ONE SHOCK, A PULLEY AND BELT WILL NEED NEW CABLES AND HAVE THE ENGINE GONE THROUGH. ANY QUESTIONS FEEL FREE TO CALL, 914 484 0540 ASK FOR PAUL. Just a note to say that I bought this hulk! It’s a long story…… Looks like it will be a parts donor. Keep up the good work with the site! Thanks for your dedication! Jim. Sorry about the late reply Jim, this site gets a ton of spam in the comments and it takes a while to sort through it. Thanks for the comments and best of luck on your Pigeon projects. Wow, that looks like an 80 or 83. I’ve got an 83 that’s been sitting in a shed for a few years. 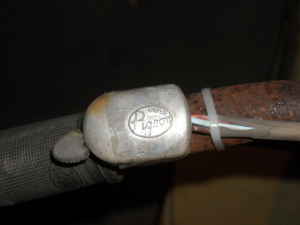 Gas line is shot, electrical has been rigged to work regardless of key. Trying to finally get it back in working order. It ran when it was put away a few years ago. It’s great to find other Pigeons! 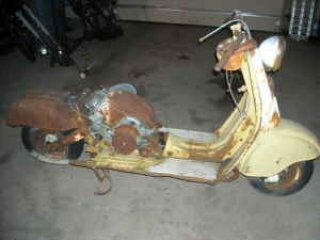 There is a tail section probably off of a C-80 in rough but usable conditions on ebay right now. I helped the seller evaluating what it is and he want’s to hold on to it and find someone that can use it now. He has an Ebay shop, just ask him thru one of his other auctions. It has a nicely weathered look to it. Jumped right at me and I instantly thought about converting this to some sort of rat chair or rat minibar but it would be a shame.